Waffle On About Planes, Trains & Automobiles Hello and welcome to the Christmas edition of Waffle On and what better way than to reminisce about a classic feel good Christmas film from John Hughes. 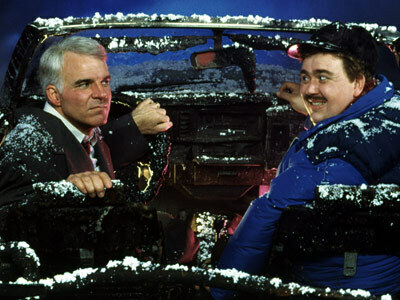 Planes, Trains & Automobiles came out in 1987 and is actually a Thanksgiving set film but hey, come on it feels and looks like a Christmas film and as we in England don't celebrate thanksgiving we class it as a Christmas film. Starring Steve Martin and John Candy in the lead roles this films which is basically a road movie comedy, it is packed with laughs, slapstick and of course feel good moments. We pack this episode of Waffle On with clips from the film and a couple of songs featured on the soundtrack. Many thanks go to Jen Rhodes from The Anomaly Podcast and Stephen Curtis from Tiny Bronco Productions who sent us mp3 comments about this film As is our norm these days we play a classic song from the film after the promo's so please do listen through and enjoy the brilliant tune. Finally may we take this moment to say thank you for staying with us in 2010, we cant wait to bring you more Waffle On's in the New Year, so please do have a very Merry Christmas and a Happy New Year. Meds and Kell.